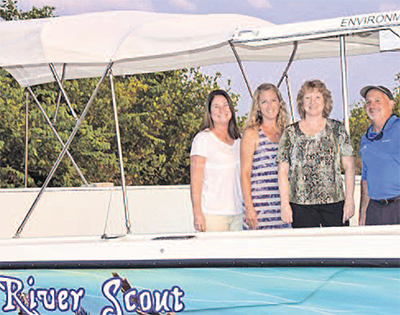 JENSEN BEACH - for more than 40 years the River Scout has served the Environmental Studies Center and carried more than 100,000 students to give them an experience that no classroom can match. The boat's unique design and the fact that it's carried generations of Martin County schoolchildren make it instantly recognizable and a cherished sight whenever it's spotted on the water. This year, students and local boaters will notice some major changes to the River Scout. 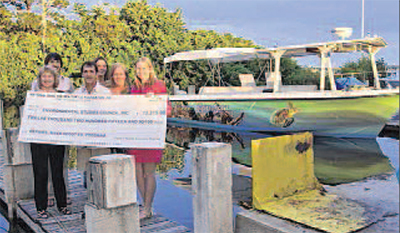 The boat received a large upgrade with support from the Environmental Studies Council and a grant through the National Save the Sea Turtle Foundation. Most notably, the entire boat received new paint and an exciting hull wrap depicting an underwater scene complete with a sea turtle, fish, and coral reef. Safety equipment, including a new VHF radio and Garmin navigation system, were installed. New life jackets were also purchased for all the staff and students. Before being launched back into the water, the River Scout's motors were inspected and prepared for the new school year. The River Scout was officially unveiled to the Center's supporters and community partners on September 24 at the Central Marine Services boat yard. Community partners were able to see the improvements up close before the boat returned to the Indian River Lagoon to help Martin County students explore the marine environment. The project could not have been completed without the dedication and support of local businesses and community partners. The project was managed by and completed at Central Marine Services in Stuart. The hull was prepared by Eco Strip, the new hull wrap was custom designed by Sign Jungle, and the engines were serviced by Rick Parker Marine Services. The National Save the Sea Turtle Foundation has worked since 1987 to provide educational programming, promote public awareness of Florida's marine ecosystems, and support sea turtle research both in United States and abroad. For more information, visit www.escmc.org or call 772-219-1887, ext. 121. Frank Wojcik, center, president of the National Save the Sea Turtle Foundation presents a check for $12,000 to Marilyn Gavitt, Center coordinator; Cody Mott, Council president; and Council trustees Peggy Paterson, Mary Radabaugh and Kim Waser Nash. The project was managed by and completed at Central Marine Services in Stuart.